Daniel & Robert started NEAT in Roberts 1600 century basement in Stockholm, Sweden where they arranged illegal raves. The first lineup in 2005 was Jesper Dahlbäck live on 606, 909, 303 etc. When they were shut down, NEAT moved to an island call Riddarholmen where they created a 3 floor and very creative house and techno club which received a large amount of good PR. Later on they moved to Grodan (the best house/techno venue at that time) and F12 (Fredsgatan 12) in the summers. On every event they offered some interesting theme besides booking artists like 808 State, Ellen Allien, Modeselektor, Nina Kraviz, DMX Krew, I-F etc. In 2016 NEAT was reborn in an exciting live format. 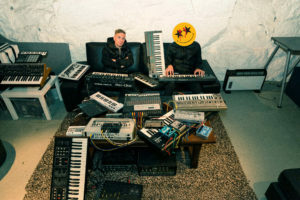 With primarily analog synthesizers, drum machines and effect gears from their music studio they play live at different clubs and raves in Stockholm. NEAT is another new debut act and exclusive signing on Exploited.